Absolutely. Not only is it legal but it works just great. If you’re willing to run a line between your two houses, there’s no reason for each of you to have your own antenna, at least if you plan properly. The one thing you’ll need is a simple splitter like this one. You may even have one sitting in your junk drawer. Old cable TV and satellite splitters sometimes work too, but it’s best to have the right tool for the job and let’s be honest here, the price is right on this splitter, it’s not going to break the bank. There’s only one downside… remember that old adage “there’s no such thing as a free lunch?” It applies with antennas too. When you split the signal between your two houses, half the strength goes to you and half goes to the other guy. This isn’t as bad as it sounds, though. First of all it’s not like you get half the stations and your neighbor gets half the stations. What I’m saying is that the signal strength you both get is going to be reduced by at least half, probably just a touch more because some of it gets lost in the splitter’s electronics and connections. That means you and your neighbor should plan for a little stronger antenna or add an amplifier that will make the signal strong enough for both of you. You’ll also need to strategize how to get the cables from one house to another. Regular cable really isn’t designed to dangle in mid air and it’s not designed to be buried either. You can run a guide wire between your houses or run the cable through a piece of PVC pipe underground. If you’re really serious, get burial-rated cable but it isn’t cheap. Sharing antennas is actually a great way to get around homeowner association regulations, especially in townhomes. It’s a solution that’s been around for decades and is actually the basis of today’s cable TV companies. back then, they called it “master antenna television” or MATV, and the idea was that there was one very large antenna at a high point in the neighborhood and everyone shared it. Can one antenna feed an entire neighborhood? There’s a limit to how many people can share an antenna. It really depends on how noisy the signal is when it comes in. Every time you split it, you cut the signal down in strength. Not only that, every time you amplify it, you add noise. So eventually the noise gets to be almost as strong as the signal. When that happens, you really can’t split anymore or everyone will lose antenna signal. This is true in cable TV, satellite, and cellular boosters as well… it’s pretty much a universal law of how signals travel through wires. But trust me, as long as your neighbor is getting nice, clear signals on his TV you won’t run into that problem. So, go ahead and split the signal between your two houses. Simply make sure you’ve decided how the cable is going to run between you. Then, make sure that everyone can get the channels you want to get. If you both can’t get the channels you need, you should consider adding an amplifier at that point. It’s that easy! 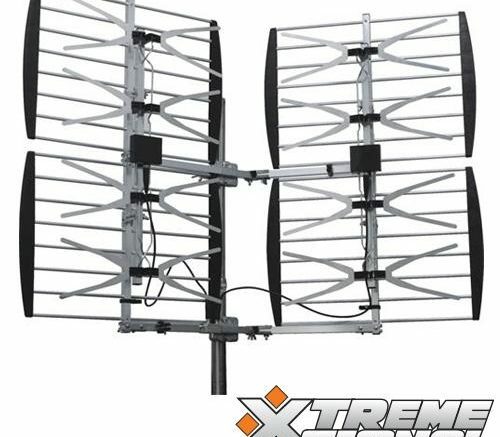 Is it normal for an antenna to sway in the wind?